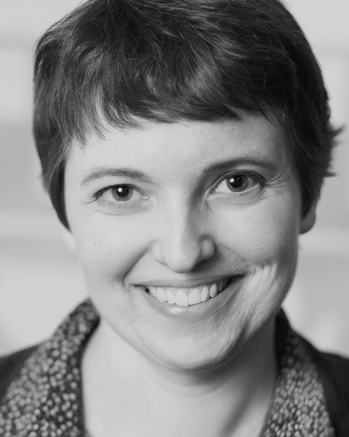 Jen Masengarb teaches adults and kids about the city and its architecture at the Chicago Architecture Foundation where she writes, teaches, lectures, and designs programs. Several times a year she gets to collaborate with the brainy folks at WBEZ's Curious City to sleuth and report on listener-submitted questions about Chicago's architectural history. When she's not riding the 'L' and writing haiku that chronicle life in the city, she's plane spotting and dreaming of ways to use her passport. She'd like to hear about your favorite place for tacos. Please join Jen and our other amazing readers on Tuesday, Oct. 4, 2016 in the upstairs bar at Hopleaf. Doors open at 7pm, and the show starts at 7:30. It's free, and 21-and-over. 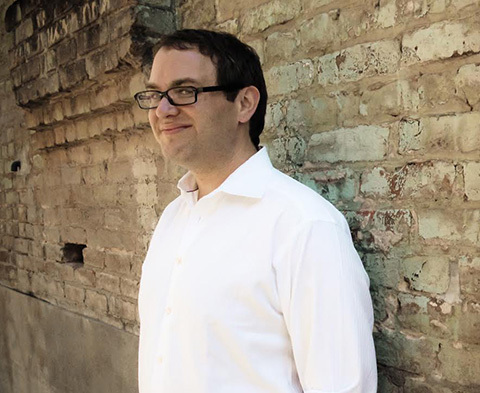 Kevin Smokler (@weegee) is the author of Brat Pack America: A Love Letter to 80s Teen Movies and Practical Classics: 50 Reasons to Reread 50 Books You Haven't Touched Since High School. 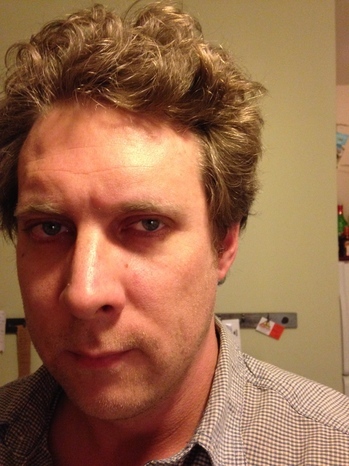 His writing about pop culture has appeared in Salon, Buzzfeed, Vulture and on NPR. 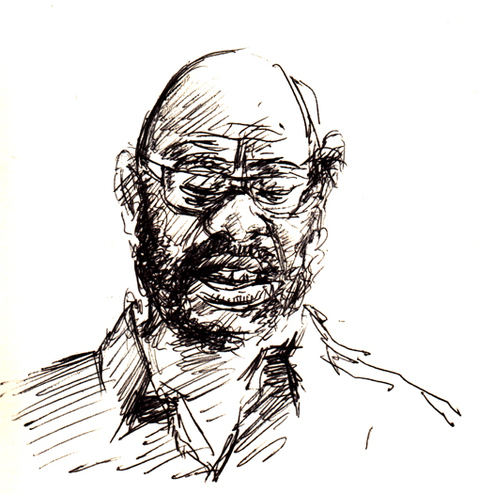 Originally from Ann Arbor, he lives in San Francisco and when in Chicago, at the Wormhole Cafe. Please join Kevin and our other amazing readers on Tuesday, Oct. 4, 2016 in the upstairs bar at Hopleaf. Doors open at 7pm, and the show starts at 7:30. It's free, and 21-and-over. K.B. Jensen is an author, journalist and ski instructor. Her first book, Painting With Fire, an artistic murder mystery, hit the bestseller list for crime novels on Amazon and has been downloaded almost 70,000 times. 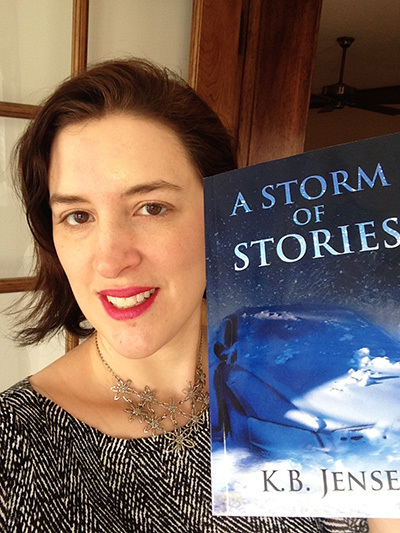 Her new book, A Storm of Stories, veers into more literary territory with themes of love, craziness and impossibility. K.B. grew up in Minneapolis and currently lives in Chicago with her husband, daughter and rescued border collie/lab mix. But she won't be a Midwesterner for long -- she's actually in the process of moving to Colorado. K.B. 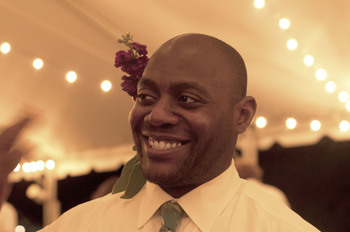 is also the founder of Indie City Writers, a writing collective on the South Side. Please join K.B. and our other amazing readers on Tuesday, Oct. 4, 2016 in the upstairs bar at Hopleaf. Doors open at 7pm, and the show starts at 7:30. It's free, and 21-and-over. Henri Harps is a guitarist, writer and jazz fanatic born in Washington D.C. After spending nearly a decade navigating the flailing cultural milieu of New York City - he has finally come to terms with his right to lower blood pressure and clearer head space to pursue more varied creative endeavors. He does this from a happy home in Chicago, which he shares with his wife, menagerie of aging animals, and a continually expanding array of musical instruments. Please join Henri and our other amazing readers on Tuesday, Oct. 4, 2016 in the upstairs bar at Hopleaf. Doors open at 7pm, and the show starts at 7:30. It's free, and 21-and-over. 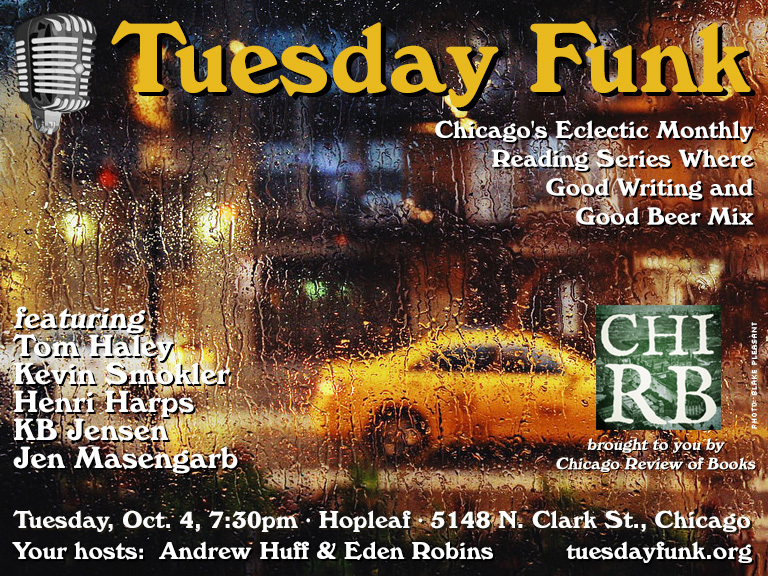 An autumn chill will soon be in the air, and the 98th edition of Tuesday Funk, your favorite eclectic monthly reading series, will soon be back in the upstairs bar at Hopleaf. Join us in the upstairs lounge at Hopleaf for readings by Tom Haley, Kevin Smokler, Henri Harps, KB Jensen and Jen Masengarb. This page is an archive of recent entries in the Reading # 98 category. Reading # 97 is the previous category. Reading # 99 is the next category.